The hottest thing in the organic and dieting worlds right now are these crispy greens. I was skeptical at first because I really don’t love kale. Jason, on the other hand, enjoys kale, so I thought I would give them a try. Turns out, it’s delicious and they totally satisfy your chip craving with out the fat and calories. Preheat oven to 300 degrees. Wash and dry kale, then place in a small bowl. Drizzle olive oil all over the kale and season with salt. Using your hands, toss to coat. Divide the greens between two rimmed baking sheets. 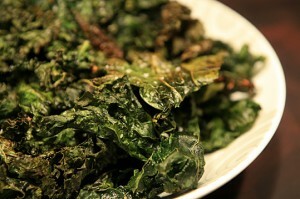 Bake until kale is crisp and just beginning to brown at the edges - about 35 minutes, tossing kale every 10 minutes. Let cool on baking sheets or wire racks. My family’s favorite snack. We kinda fight over these, they are so tasty!!!! !